Can you use RG59 cable for satellite TV? All cables are not made equal. Even two cables that look identical could still be completely different. When it comes to the coaxial cables you find in your home, they tend to fall into one of two categories: RG59 and RG6. Coaxial cables are different from the other cables in your home theater setup because they are capable of carrying a lot of information with a relatively small amount of metal. They do so through the use of a “dielectric” which is the white inner part that surrounds the center conductor. This material is unique because while it insulates the center conductor, it also becomes polarized so as to allow the electric field on the outer part of the cable to expand outwards. This creates the ability to carry signals effectively that would otherwise require a much thicker cable. Thick cables are expensive and plastic dielectrics are cheap, so you do the math. The naming of cables is a difficult matter. It is believed that the “RG” in “RG6” stands for “radio guide” and dates back at least to the 1960s when military specs were created for coaxial cable. There is no specific reason that “RG59” is close to “RG6” other than that’s what someone was doing that day. All RG cables match up to specifications that describe their construction and impedance. (Impedance describes how much a material resists alternating current or radio/TV signals, to make a very simple definition.) RG6 cable is thicker, has a thicker dielectric and a thicker center conductor. It also can have additional metal shielding on the outside of the dielectric material.These characteristics mean less signal loss over any given distance. In fact RG59 cables lose about 50% more signal over any given distance than their RG6 counterparts, and that can be a problem as lines get longer. Most coaxial cables are labeled with some sort of information right on them. Look across the length of the cable and you will usually find some sort of message indicating the cable type and manufacturer, as well as other information. Generally you’ll see “RG59” or “RG6” somewhere in this mess of letters and numbers. If you see a crimped-on or twisted-on connector, this is often a sign of an RG59 cable, just because this sort of connector isn’t popular today and neither is RG59 cable. However, crimp and twist-on connectors can be put on RG6 cables as well but they cannot be used for satellite TV. Only compression connectors can be used for satellite TV, as they are the most reliable when it comes to the very high frequencies used for satellite. 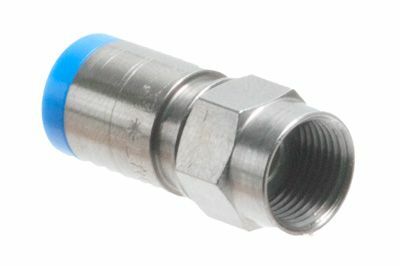 If you’re not sure what a compression connector is, take a look at the picture above, as it shows the characteristics of a compression connector. The barrel of the connector (the part further from the edge) is usually almost completely round, and there is almost always a visible ring of plastic somewhere on it. RG59 cables are narrower than RG6 cables so if you find that the cable is less than 6.5mm wide, that’s RG59. If you’re still not able to make a conclusive match, it’s best not to use that cable, period. Why are RG59 cables so bad for satellite? The thinner construction of the materials means significant loss over distance in the high frequencies used by satellite TV. A two-foot length of RG59 cable may not hurt you (or it may, who knows) but running your entire satellite system off RG59 cable can cause you to lose signal much more easily than you should and that means bad times when rainy days come. Personally I don’t recommend the use of any RG59 cable and I’m one of those guys who tends to make new cables for any occasion. I know that coax cables don’t “wear out” but I just can’t trust a cable that’s been laying around too long, especially if I don’t know where it came from. Wait, they’re still shooting stuff in SD? Why can’t you use DIRECTV SWM with a fiber optic system?